Viola is a sort of charming annual, biannual and perennial grassy plants and bushes of the family of Violaceae, with large flowers of various coloring and a dark stain. In the people this plant is better known under the name Pansies, however meet also other names: Ivan-da-Marya, Moths, Polutsvet. This one of the oldest garden cultures attracts already many centuries people with the unusual blossoming and legends connected with its origin. Still ancient Greeks and Romans interwove Viola into wreaths and garlands for decoration of rooms in days of holidays. Presently flower growers continued continue to follow their example, growing up different types of Viola (about 450, and many – wild-growing) in flower beds, borders, vases, on stony hills and when gardening balconies. 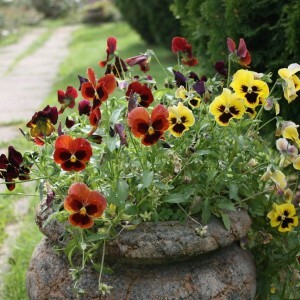 Besides Viola is the ideal neighbor and perfectly gets on with any low plants. Not less attractively they look in small spring bouquets. On a legend, the girl Anyuta who truly waited for the groom, the defender of the homeland who didn't come back home turned into this most beautiful flower. Viola. Viola variety. Garden encyclopedia.